While Karen Akunowicz was in California filming season 13 of Bravo’s Top Chef in 2015, she had to skip the gala the first time she was nominated for the James Beard Foundation’s Best Chef: Northeast award. But three years later, the Myers + Chang chef finally has the hardware. Akunowicz has led the kitchen at Joanne Chang and Christopher Myers’ beloved Chinese-American diner since 2011. She met Christopher Myers while she was a line cook at Via Matta, which Myers owned with chef Michael Scholw at the time. Akunowicz was cooking with Ana Sortun at award-winning Oleana when Bravo producers first approached her about joining the Top Chef cast, and she made it to the top 5 in the traveling California season. 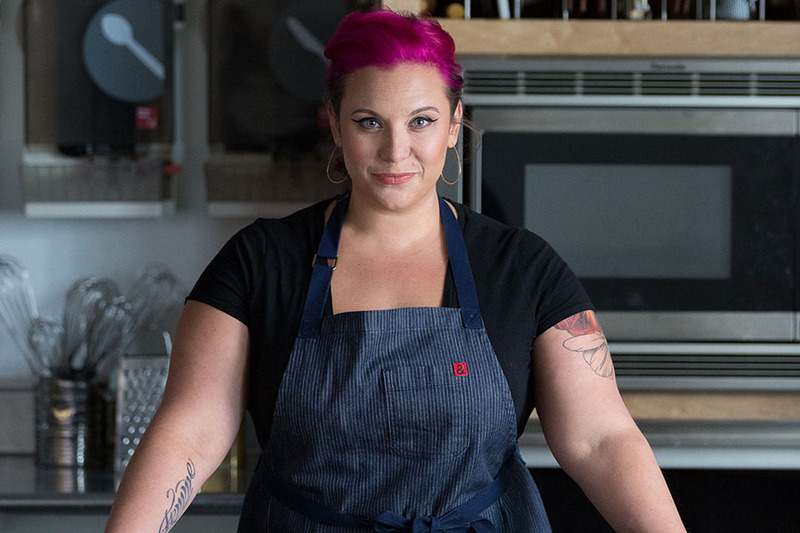 For her fourth Best Chef: Northeast nomination, Akunowicz was up against venerable Boston chefs Tony Messina, partner at Uni; Tiffani Faison of Sweet Cheeks, Tiger Mama, and more; and Cassie Piuma of Sarma; as well as Ben Sukle of Providence must-visits Birch and Oberlin. Tonight’s red carpet extravagance for “the Oscars of the food world” was livestreamed on Twitter. Prior to the show in Chicago, the James Beard Foundation lauded Galleria Umberto as one of the 2018 America’s Classics, and inducted Jody Adams of Trade, Porto, and Saloniki (and formerly Rialto) in the Who’s Who of Food and Beverage in America. It also bestowed media awards upon a crop of cookbooks, podcasts, columns, and other culinary media. Check out the full list of 2018 winners at jamesbeard.org. This past fall, Akunowicz published her first cookbook, Myers + Chang at Home, coauthored with Chang and featuring dozens of Myers + Chang menu staples. Make purple hakka eggplant, and a reservation at Myers + Chang, to celebrate the vibrant chef’s James Beard Award win.